Communicating with people by phone, Skype, or SMS message is often more effective than sending bulk marketing emails. Email And Phone Extractor will find and collect contact information for you within a couple of minutes, and you can spend the time you save on yourself. Email And Phone Extractor extracts email addresses, contact information, and Skype, MSN, AOL, Yahoo, and ICQ IDs from the web. 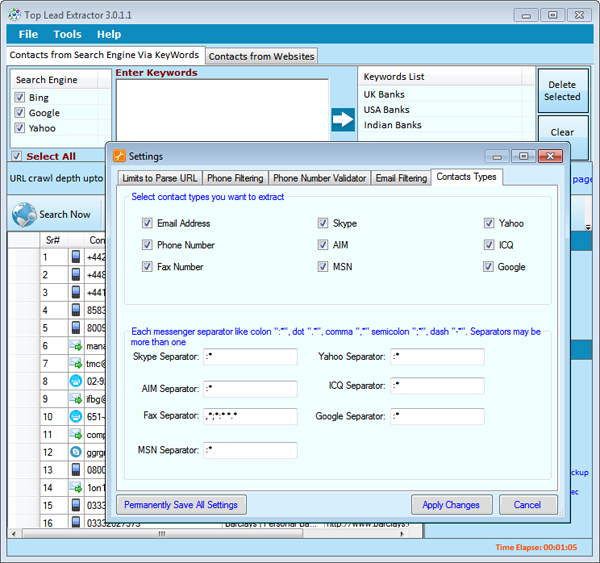 Email And Phone Extractor supports targeted searches like advance search of google, yahoo, bing etc. It has an option to extract selected or all kinds of information like email addresses, phone numbers, messengers ids (skype, icq, MSN, yahoo). 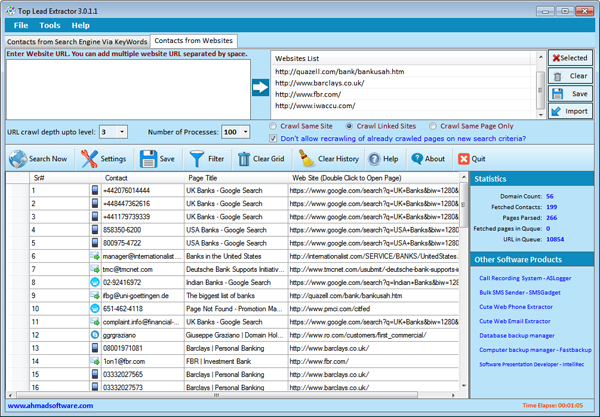 Email And Phone Extractor has long list of customize-able options so that you can customize your search and search results according to your target and needs. 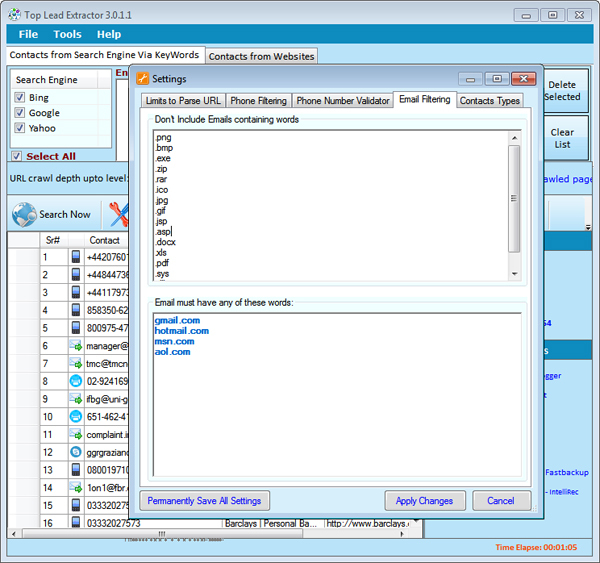 Email And Phone Extractor searches for email addresses. Due to the multithreading power of the software, the process runs quickly, and at the end of it, you are provided with a list of emails of potential clients. To save bandwidth and your precious time "Email And Phone Extractor" has an option "Don't allow recrawling of already crawled pages in new searches". Email And Phone Extractor automatically pauses/resumes on internet failure during processing. Email And Phone Extractor support unicode contacts. You can also save fetched contacts in unicode format. 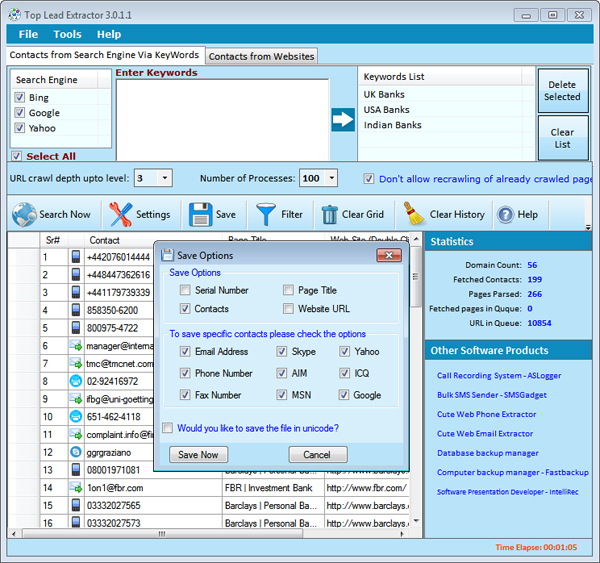 Email And Phone Extractor support more than 66 search engines. You can search according to your country. Email And Phone Extractor can extract different information types: email address, phone and fax numbers, Skype, MSN Messenger, Yahoo Messenger, ICQ, and AIM. 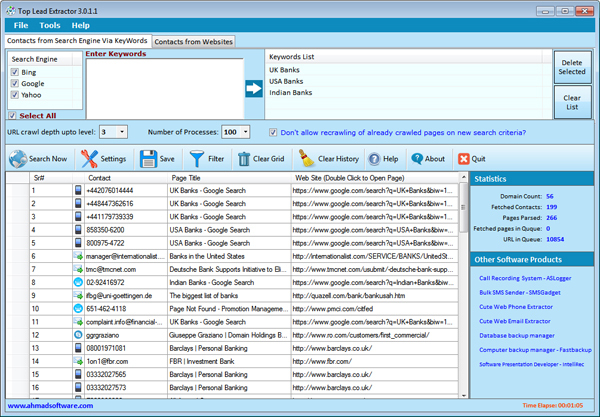 Email And Phone Extractor will extract data by the entered keyword related to your niche. The program will use the search engine(s) specified. Then it will scan all of the websites and look for information. In the settings, you can tell the "Email And Phone Extractor" which types of URL should not be crawled. 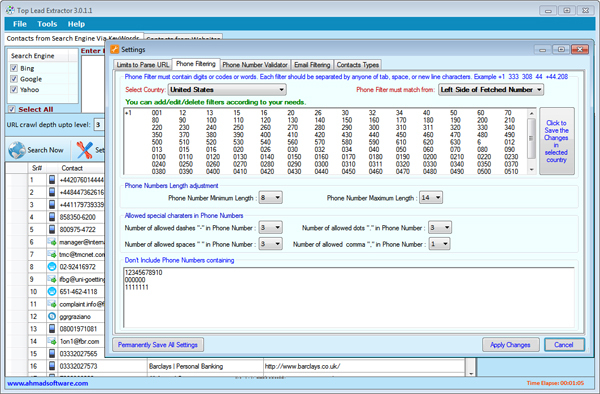 Email And Phone Extractor provides options to save contacts in EXCEL format, .CSV files (Opens in EXCEL), TAB delimited (.txt files) format. Save searched results separately i.e. phone numbers, emails and messenger IDs in different files. Don't parse and crawl URL having: "Email And Phone Extractor" will not crawl URL if URL contains keywords listed in list. You can remove any keyword from default list.